Ketchum, Idaho-based Rebecca Rusch is one of the most accomplished professional cyclists and adventure athletes of all time. Three-time 24-Hour Solo Mountain Bike World Champion, first at the Raid Gauloises Adventure Racing World Championships, four-time Leadville Trail 100 MTB winner and women’s record holder, three-time Dirty Kanza 200 Gravel Grinder champion, and the list goes on. But the ride that she considers the most difficult and most rewarding was absent of competition. 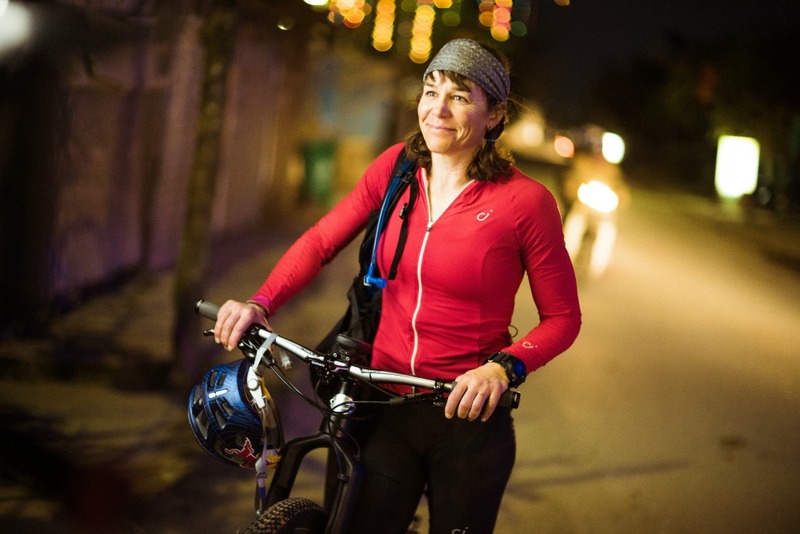 In 2015, Rusch embarked on a 1,200-mile journey on mountain bike in an attempt to be the first person to ride the entire length of the Ho Ci Minh trail through Vietnam, Laos, and Cambodia. The story is deeply powerful on a personal, historical, and emotional level as her father was killed during the Vietnam War when Rusch was a small child. This experience was beautifully captured in the film Blood Road, which will be premiering on March 15 at the Sun Valley Film Festival. We caught up with Reba, the Queen of Pain, in a rare moment of down time. BigLife: How did this journey go from an idea in the back of your head to a reality? Rebecca Rusch: Like all big ideas, it was a collaborative process and took years to cultivate. My first visit to Vietnam was in 2003 for the Raid Gauloises 1000-km adventure race. Being in the jungles of Vietnam and seeing the Air Force Base where my father was stationed and all of the historic battle grounds prompted a desire for me to explore his history more deeply. His remains were identified in 2007 and it took until 2013 for the idea to ride the Ho Chi Minh Trail to take shape. Red Bull always asks their athletes to pitch innovative and creative projects, so I took this to them. It was approved a year later, and we were off and running with intense planning and research to piece together an historically accurate route, secure the approvals, and nail down the logistics. Initially Red Bull Media House (RBMH) had this slated for a much smaller project, but while we were there and the story unfolded, they knew they wanted to tell the whole story. I didn’t set out to make a film about this ride and my journey, but it evolved into that and I know that without the help of RBMH, I would not have been able to complete this complicated project on my own. The details and the challenges would have been too overwhelming to tackle alone. BL: What makes riding your mountain bike across the entire Ho Chi Minh Trail a departure from the normal challenges you’ve faced? RR: Although this was the biggest and most important ride of my life, this was not a race. There was a start and a finish location and a goal to complete the ride, but there was no competitive aspect to this journey. I’ve been a competitive athlete my entire life in various different sports. I’m trained to go from point A to B as fast as possible. This was an evolution of my career because I still had to rely heavily on all of my skills and experience as an ultra-endurance athlete to complete the ride, but the emotional nature, the unexpected challenges of filming along the way and riding with a stranger as a teammate—that was all new territory for me. BL: We love the fact that this film captures a story that goes beyond the realm of sport and physical strength. How exactly does Blood Road do this and what are some of the major revelations you took away from the experience? BL: You had a Vietnamese riding partner named Huyen Nguyen for the entire journey. What is her story and how did she contribute to the experience? RR: Huyen is the most decorated cyclist (male or female) in Vietnam. She is the 4x winner of the Southeast Asia Games and is well known for her cycling. She retired from cycling and is now a mother and a teacher/coach. 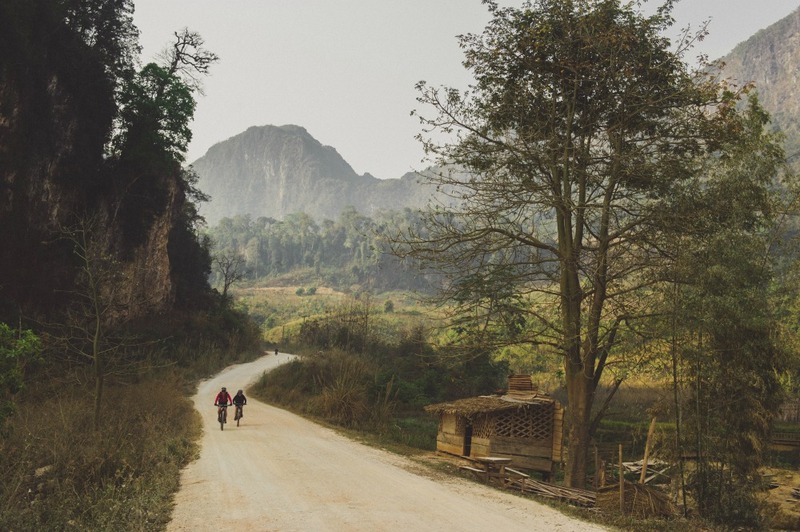 The director, Nicholas Schrunk, really wanted to find a Vietnamese riding partner for me to help bridge the gap in our cultures and be a gateway for me to understand the other side of the conflict. She doesn’t have the extreme endurance experience I do, so part of my role was to share my athletic experience to help her complete the journey. Her role, although not defined ahead of time, really became more than just a riding partner. She was a window into the culture and a way to help me slow down, open up, and experience the journey at a different pace and through different eyes than simply as a professional athlete. BL: The film is a powerful personal journey for you, but it also highlights the remarkable resilience and positivity of the locals. What are some interactions that you shared with them that stand out? RR: While Laos might be the most bombed country in the history of our world, it’s also the friendliest. I have never experienced people so kind and happy in my life. We had interactions every day with kids riding alongside on their bicycles, running out to greet us and yell “Saibadee” (hello). We were invited into villagers’ homes to share food and drink and to bless the spirits to provide a safe journey for us. Everywhere we went, people were curious, wanted to engage and help us—and were completely open and uninhibited. BL: Describe the riding experience on the Ho Chi Minh Trail. Singletrack? Dirt roads? Technical? Confusing? 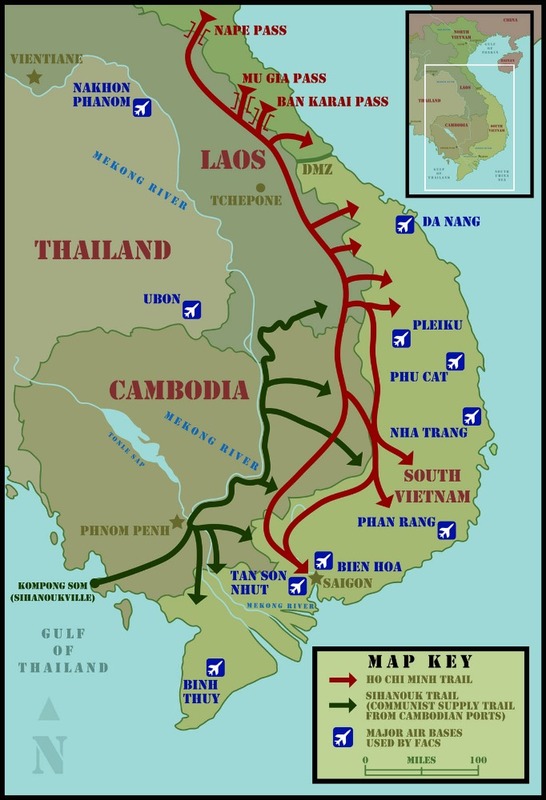 RR: The Ho Chi Minh Trail is a historical network of paths and roads. It’s a labyrinth and a living history. It’s not like there are signposts that say “this way to the HCMT.” Some of the route was busy paved road in areas around the big cities of Hanoi and Ho Chi Minh City, some parts were narrow singletrack connecting small villages. The only traffic in some of these very remote areas is foot traffic and livestock from villagers. Other areas are dirt roads, often washed out by the torrential rains that happen regularly. Some places were original cobblestone hand laid in the ‘70s during the war. The amazing engineering and skill used to build these roads shows since they stand the test of time and erosion. Was it technical? Yes, sometimes too difficult to ride with the jungle becoming thick and overgrown or huge rain ruts that were nearly impassible. Sometimes it was easy riding, but the conditions with heat, sun, and the elements provided the challenge. Navigation was a constant challenge as this was not even mapped until recently and the country has many areas of unmarked spider webs of trails and roads. BL: What was it like working with Red Bull director Nicholas Schrunk? How did Red Bull contribute to making this project happen? RR: Nicholas Schrunk is a young director and, like me, this was the biggest film project of his career. We were joined in this project by Red Bull Media House and they assured me he was one of their best. While it’s challenging to add in the element of documenting a story, especially one as complicated as this in remote, extreme conditions, it became clear to me very early in the planning that Nick’s attention to detail, creativity, and work ethic are world class. In such extreme conditions with such a deep, personal story, it didn’t take long for the entire crew to form a deep bond and trust for each other on the trail. Red Bull Media House, Nick, and Sandra (Supervising Producer, Special Projects at Red Bull Media House) made this trip possible. Without their tireless research, logistical planning, and desire to tell this story, I could have never taken this journey. BL: Why did you decide to share such a deep personal experience with the world? RR: I set out to take an important personal journey. I didn’t necessarily set out to tell the story to the world. But as the trip and the content and the depth of the story unfolded, it was clear to me and to Red Bull Media House that we had a responsibility tell this story to the world. The beauty of the place, the people and the universal importance of the message had to be told. I’m very proud of the way that we were able to capture and tell this story of forgiveness, healing and exploration. World Premiere March 15, 6:00 p.m.
Encore Screening March 18, 1:30 p.m.